The journey is now finally over, with the Special Extended Edition of The Hobbit: The Battle of the Five Armies available on DVD and BluRay. 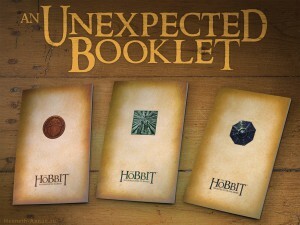 However, some fans still hold a small grudge: once again, there is no booklet included in either of the multiple versions of BOTFA EE. If you recall the times of The Lord of the Rings SEE: each box contained a beautiful little book with parchment-like pages which not only contained stylish pencil sketches by John Howe and Alan Lee, but also held some useful information. Not only was there a chapter list with new and extended scenes specifically pointed out; there was also a navigation help through tons of the bonus materials structured in complex tree-like submenus. Even the BluRay version of LOTR SEE still contained these booklets. Not The Hobbit, however. As some fans like consistency in their collections, the chief editor of the Russian tolkien website Henneth-Annun.ru, Pete “TheHutt” Klassen, began the non-commercial “Unexpected Booklet” project two years ago — designing fan booklets for The Hobbit SEEs. Each year, a new booklet was created for “The Hobbit” using the well-known LOTR SEE look and feel as well as illustrations by John Howe and Alan Lee. It is entirely free for download and self-printing, released under the Fair Use clause. Now the booklet for The Hobbit: The Battle of the Five Armies SEE has finally been released, for different media (BluRay 3D, 2D and the good old DVD). All three booklets are available in English, German, Russian, and — for the first time — Italian (translation by Stefano Fatone). You can download the booklet for home printing here: Battle of the Five Armies EE fan booklet. Battle of the Five Armies SEE booklet.